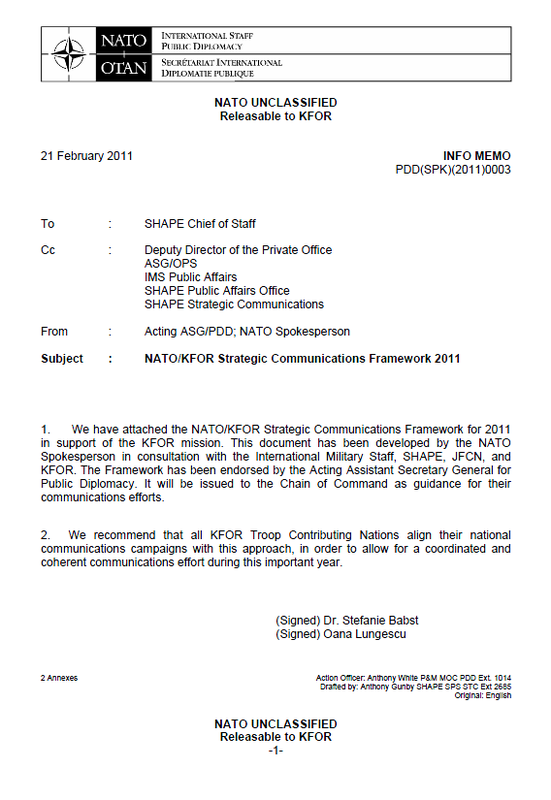 The following is NATO’s strategic communications framework for operations in Kosovo in both 2011 and 2010. Though unclassified, NATO doctrine and policy documents are not released to the public. 1. The mission of KFOR as authorised by the North Atlantic Council (NAC) is to contribute to a safe and secure environment in Kosovo and to support the development of security institutions capable of operating without NATO assistance. 2. In recognition of the improved security situation in Kosovo, KFOR in 2010 began to gradually reduce its force levels and posture by moving to a “Deterrent Presence” (DP) posture. The first phase of KFOR’s move to Deterrent Presence, so-called “Gate One”, was achieved on 31 January 2010. The transition to Gate 2 was approved by the NAC on 26 October 2010 with achievement by March 2011. With the move through Deterrent Presence, NATO will gradually adjust the number of troops deployed in Kosovo. By the time Gate 2 is achieved, KFOR troop levels will be around 5,000 in total. 3. In 2010, the NAC approved the transfer of lead guarding responsibility for a number of Properties with Designated Special Status (PrDSS) from KFOR to the Kosovo Police. Subsequently, the responsibility for four out of the nine PrDSS was transferred to the Kosovo Police. This “unfixing” process is expected to continue, as conditions permit and subject to NAC approval, during 2011. 4. KFOR is assisting in the stand-up and training of the Kosovo Security Force (KSF), an all-volunteer, multi-ethnic, lightly-armed security force under democratic, civilian control. The KSF’s mission is to conduct civil protection operations and to assist civil authorities in responding to natural disasters and other emergencies. KFOR’s training role is limited to assistance and advice in these areas. Initial KSF operating capability was declared on 15 September 2009. As recruitment and training of KSF members proceeds, expectations of a declaration of KSF Full Operational Capability will continue to grow. 5. The adaptation of KFOR’s force posture during 2010 and its unfixing from Properties with Designated Special Status have been supported by an effective strategic communications (StratCom) approach which has been closely coordinated at all stages throughout the NATO chain of command and NATO HQ. Continued StratCom efforts will be required to complement and support military and civilian activities during 2011 as KFOR’s footprint and posture continues to adapt and as progress is made toward mission achievement. 6. The aim of this framework is to establish NATO’s StratCom objectives, themes and messages in Kosovo for 2011, which will guide all NATO/KFOR activities in the communications and information environment. f. build trust in local security institutions and EULEX in line with KFOR’s role as third responder. Create Conditions – NATO’s role is to contribute to a safe and secure environment Kosovo-wide, thus creating conditions for dialogue amongst all stakeholders to support broader democratic, economic and social progress.